The town of Downpatrick in the heart of the County Down Area is one of Northern Irelands busiest commercial and tourist town centres. A drainage area study of the town’s sewerage system was carried out and a number of key projects identified to improve the system, reduce likelihood of out of sewer flooding and restrict storm discharges to the local river environment in line with criteria set out by the Northern Ireland Environment Agency. The proposed infrastructure improvements will involve the installation of deep sewers along existing roads with associated traffic and pedestrian restrictions required to allow the works to be completed in a safe environment. The work would normally cause severe disruption to the local community and business and it is essential that this disruption is minimised as far as is reasonably possible. Terra Solutions carried out the installation of 270m of deep sewers through the main commercial and tourist areas of Downpatrick using our Herrenknecht AVN1000 tunnel boring machine. We also constructed 5 deep manhole shafts using smoothbore caissons to act as launch and reception shafts in internal diameters of between 2.4m and 5m. The ground conditions and abundance of legacy services in the area were certainly important factors, but perhaps most importantly was the discovery of several significant archaeological sites which required careful management and liaison with the Northern Ireland Environment Agency. 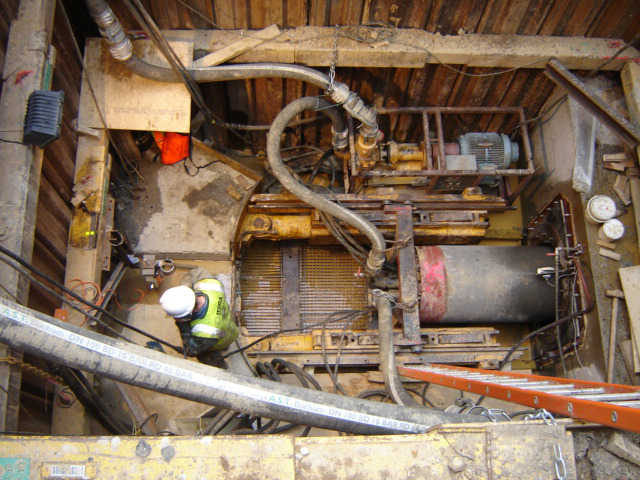 The trenchless installation was completed successfully despite some challenges arising from changing ground conditions and archaeological involvement. Our Bauer Centrifuge and Flocculation system served also to reduce the amount of water usage and sludge disposal and ultimately reduced our carbon footprint by removing the need for up to five lorry trips per week during tunnelling, further evidence of our commitment to improving environmental performance.